Seleucia, as such, was founded in about 305 BC, when an earlier city was enlarged and dedicated as the first capital of the Seleucid Empire by Seleucus I Nicator. 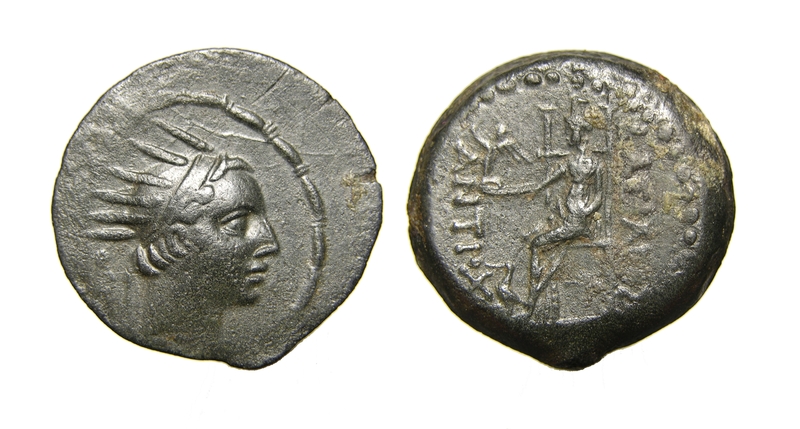 Although Seleucus soon moved his main capital to Antioch, in northern Syria, Seleucia became an important center of trade, Hellenistic culture, and regional government under the Seleucids. Standing at the confluence of the Tigris River with a major canal from the Euphrates, Seleucia was placed to receive traffic from both great waterways. During the 3rd and 2nd centuries BC, it was one of the great Hellenistic cities, comparable to Alexandria in Egypt, and greater than Syrian Antioch. Excavations indicate that the walls of the city enclosed an area of at least 550 hectares (1,400 acres). Based on this size, the population has been estimated to number over 100,000 initially and probably more later. In 141 BC, the Parthians under Mithridates I conquered the city, and Seleucia became the western capital of the Parthian Empire. Tacitus described its walls, and mentioned that it was, even under Parthian rule, a fully Hellenistic city. Ancient texts claim that the city had 600,000 inhabitants, and was ruled by a senate of 300 people. It was clearly one of the largest cities in the Western world; only Rome, Alexandria and possibly Antioch were more populous. In 55 BC, a battle fought near Seleucia was crucial in establishing dynastic succession of the Arsacid kings. In this battle between the reigning Mithridates III (supported by a Roman army of Aulus Gabinius, governor of Syria) and the previously deposed Orodes II, the reigning monarch was defeated, allowing Orodes to re-establish himself as king. In 41 BC, Seleucia was the scene of a massacre of around 5,000 Babylonian Jewish refugees. In 117 AD, Seleucia was burned down by the Roman emperor Trajan during his conquest of Mesopotamia, but the following year it was ceded back to the Parthians by Trajan's successor, Hadrian, then rebuilt in the Parthian style. It was completely destroyed by the Roman general Avidius Cassius in 165. The city eventually faded into obscurity and was swallowed by the desert sands, probably abandoned after the Tigris shifted its course. Obvs: Radiate head of Antiochus right, within fillet border. BX monogram behind head. Revs: BAΣIΛEΩΣ ANTIOXOY, goddess with polos seated left on high-backed throne holding Nike. Bird standing left at feet, dotted border.